Support a Cause, have a Date with Us & e Elephants! Elephant Parade is an open-air art exhibition that attract worldwide attention as well as much-needed public awareness and support for the cause of elephant preservation and conservation. 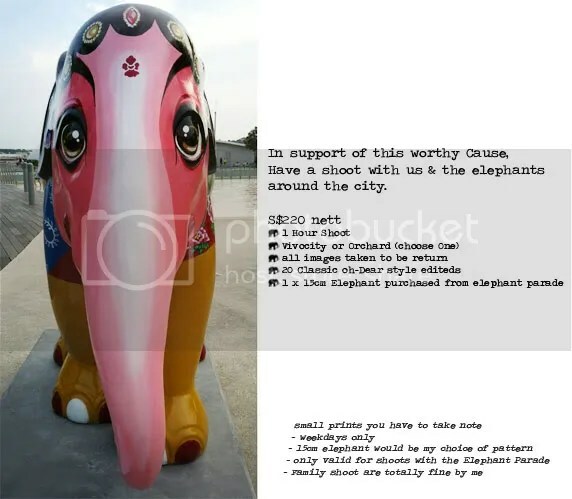 I would like to support this cause by offering a 1hour Couple shoot with these beautiful Hand-Painted Elephants (location is either Vivo/Orchard) at a Special Price of $220. At the end of the shoot, You would receive a 15cm Elephant from us. We are buying these Elephants from ElephantParade to support this cause. Each elephant would be lovingly handpainted by us, so it’s unqiuely YOURS’! This entry was posted on November 11, 2011 by ohdearphotography. It was filed under Uncategorized .